Jack Daniel's Tennessee Honey is a honey liqueur from the makers of Jack Daniel's Tennessee Whiskey. Golden coloured, with rich aromas of honey and roasted nuts, the liqueur has naturally sweet honey flavours alongside delicate hints of molasses and pralines, followed by a long, rich honey nut finish. Jack Daniel's Old No. 7 Tennessee Whiskey is a premium whiskey made using the finest ingredients and mellowed through 10 feet of sugar maple charcoal, before being aged in charred oak barrels. It is this unique way of making whiskey that makes Jack Daniel's what it is - a smooth sipping Tennessee whiskey and not a bourbon. Jack Daniel's Tennessee Honey is an original recipe of Jack Daniel's Old No. 7 Tennessee Whiskey blended with a unique honey liqueur of their own making. For smooth, easy-drinking enjoyment, this particular Jack is best experienced when it's poured over ice and shared. 35cl bottle, 14 serves in every bottle (25ml per serve). Flavour profile: Smooth and sweet. Colour: Gold honey. Nose: Rich notes of natural honey, sweet molasses and roasted nuts. Taste: Sweet and delicate hints of molasses, chocolate and pralines followed by smooth, long trails of rich honey and nut character. 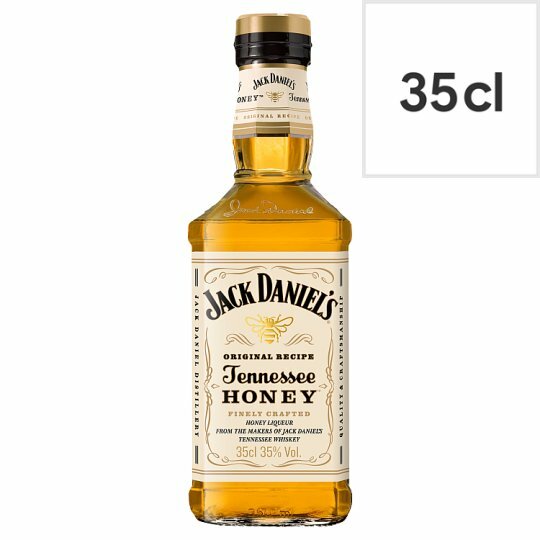 Jack Daniel's Tennessee Honey is best served chilled over ice, or mixed with lemonade.